A few years ago, a friend was cleaning out her old magazine collection and gave me a stack of ones she thought I might like. I'm not a magazine hoarder, actually, so I just quickly flipped through the pages and then got rid of them. All except for the one page I tore out of a Martha Stewart Living issue with a recipe for a baked risotto tart. What?? I needed a baked risotto tart in my life immediately. The recipe came out delicious but I thought the process was overly complicated. All the constant stirring and careful watching that goes into making a creamy risotto was really wasted after it got baked and firmed up. 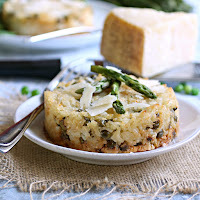 So I began experimenting with baked rice dishes that didn't use the risotto technique and they tasted the same. 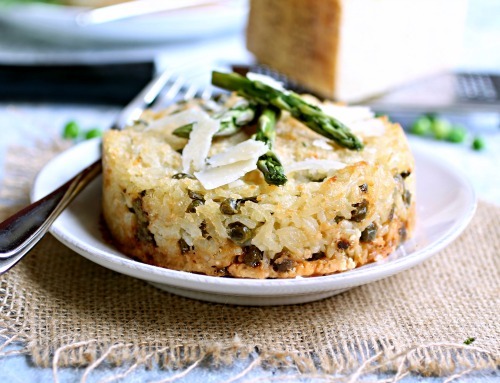 I got the great flavor of a baked rice dish in an easier to make recipe. Much more my style. You can make this in a casserole dish but it looks so great molded in a spring-form that I love making it that way and serving it to company. In this version I've added spring vegetables and a side salad and I'll have a perfect Mother's Day brunch. Of course, a good risotto includes plenty of Parmesan cheese and it's my favorite part so I certainly didn't skimp on it here. 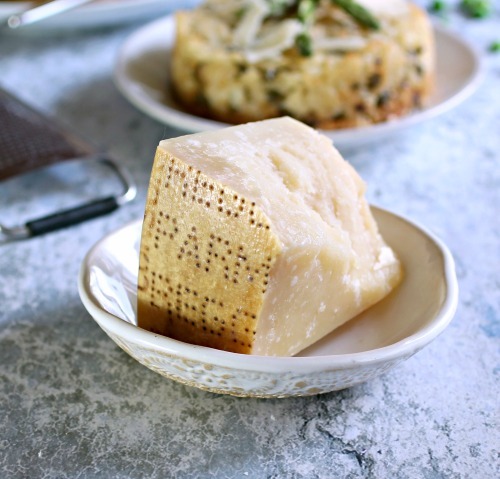 Speaking of Parmesan, it's a staple in my refrigerator and many of my recipes call for it. But when I say Parmesan, I mean imported Parmigiano Reggiano which only ever contains 3 great ingredients - milk, sea salt and rennet. Domestic Parmesan is actually saltier than the original and, of course, there are plenty of low quality imitators that use other ingredients as fillers. The real stuff is what comes in giant rounds with the words Parmigiano Reggiano spelled out in pin dots. Depending on how it was cut, you might not see the pin dots on every piece so just check with the workers at the cheese counter to make sure you're getting the good stuff. Enjoy! Add the olive oil and shallot to a pot and saute for a couple of minutes, just until the shallot becomes translucent. Add the garlic and continue sauteing for another few seconds. Stir in the rice, raise the heat to high and stir to thoroughly coat. Pour in the water or stock, season and bring to a boil. Cover, reduce the heat to low and cook for 15 minutes. 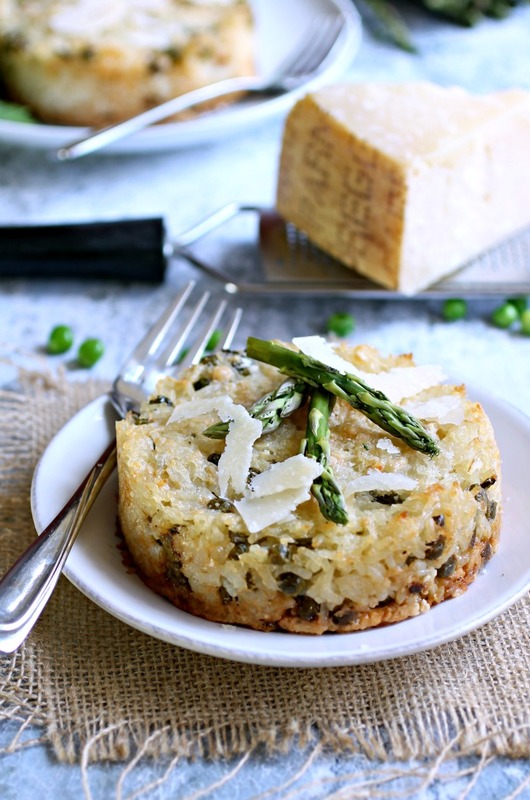 Remove from the heat and stir in the Parmesan cheese, asparagus and peas. Butter your baking pans (I used four 4" mini spring-form pans) and dust with the 2 tablespoons of Parmesan. Don't shake out any extra cheese. Pour the rice into the baking dishes and bake for approximately 40 minutes or until the tarts are a light golden brown. Run a knife along the edges before releasing from the spring-form and serve with some additional shaved Parmesan, if desired. This recipe is sponsored by delicious Parmesan.com. For more recipes and information on the authentic cheese visit their web site and follow them on Facebook, Pinterest and Twitter. Thank you for supporting the products I love and use in my kitchen.